This DVD features Owen and Jackie Harder and Bill and Bernice Hardy. The Harders and Hardys have been close friends for many years. Owen and Jackie Harder operate their business, Harder’s Farm Equipment. 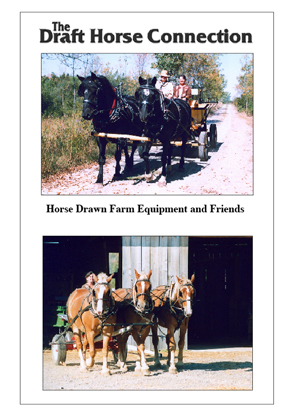 Harders sell Pioneer and Yoder farm equipment and supplies. Jackie and Owen hold hands on workshops at their farm training people how to farm with horses. Jackie and Bill demonstrate how to set up a Pioneer Forecart hooking three horses abreast. Bill and Bernice Hardy are retired farm machine dealers and farmers. Bill now restores and rebuilds wagons and sleighs. Bill and Bernice reminisce about their life working together. Bill talks about his restortation projects. Bill has been and is still a mentor to Â young teamsters. Bill and Jackie hook up a team of Canadian-cross horses to a wagon and take us for a ride. This is a enjoyable video watching and learning from these close friends as their share their knowledge and safety tips of workiing with draft horses.